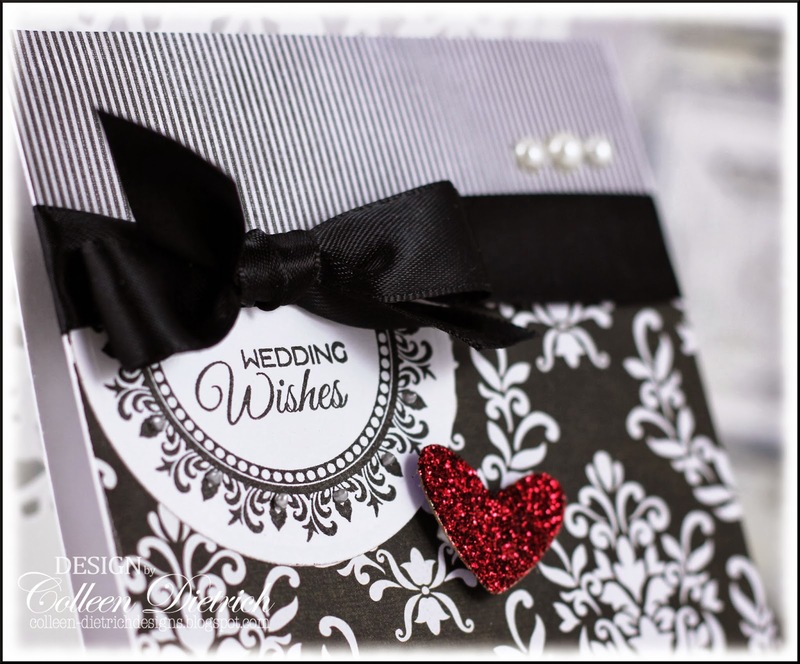 Black, white and red weddings never seem to go out of style. When I was in my 20s, I was a bridesmaid in a friend's wedding, and these were her colors. The bridesmaids wore custom-made (by the bride herself) short red satin dresses, with big, wide-brimmed black hats, black stockings, black shoes and long black gloves. Definitely the most dramatic wedding I've ever been in! You know how there are so many shades of black? Well, you can see several here on this one card. Not a good match, now that I see it in a photo. 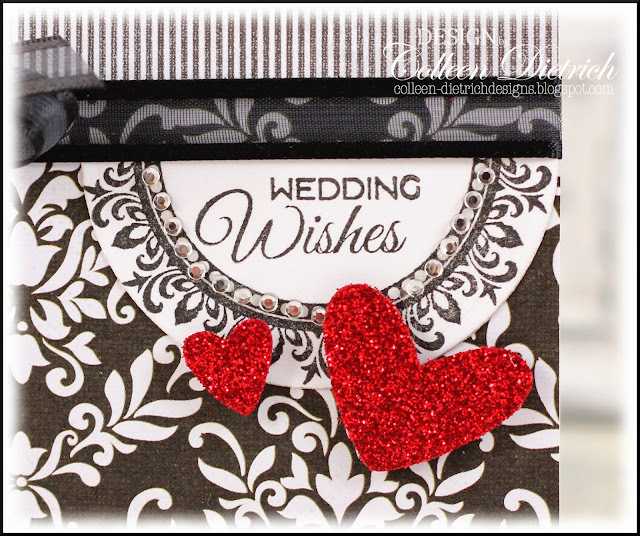 There are mini rhinestones around the Inspired By Stamping Fancy Circle frame and Verve Best Wishes sentiment. Version 2: I like the satin ribbon much better, but the glitter on this heart is less red, more toned down. Hard to see, but there are silver Liquid Pearls around this framed sentiment. 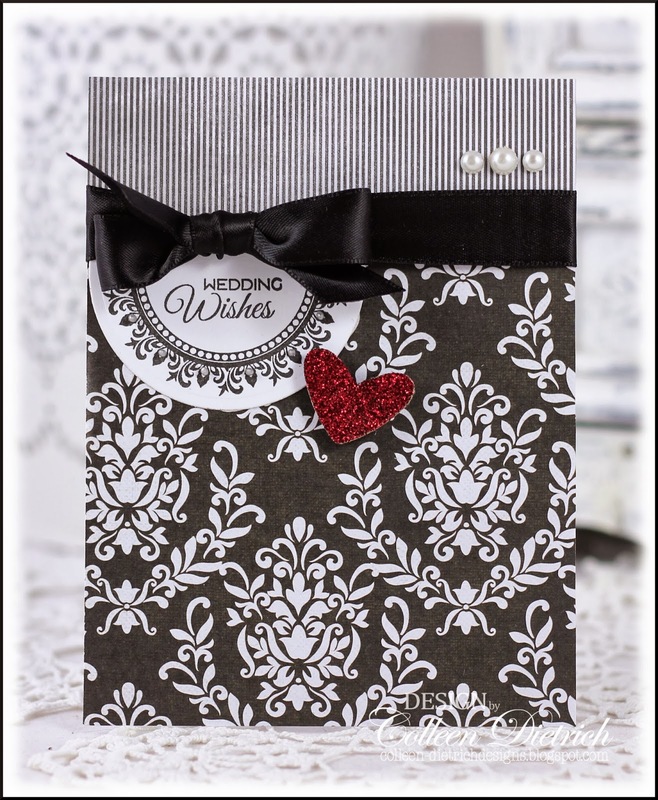 Stamps: Best Wishes - Verve; Fancy Circles - Inspired By Stamping Paper: (stripe) Harper's Boutique - The Paper Studio; (damask) Best of Damask - My Mind's Eye; white - PTI Ink: Versafine Onyx Black - Tsukineko Fibers: sheer/stripe black ribbon - Offray; black satin ribbon - Michaels Accessories & Tools: Garnet glitter - Martha Stewart; dark red glitter - Creative Impressions; Heart to Heart punch - SU; silver Liquid Pearls - Ranger; pearls - Queen & Co. These are gorgeous!! LOVING the bling and the hearts!! And loving that old bridesmaid photo of you!!! Gorgeous card. Love B & W and red cards and this one is a stunner. You look so pretty in the dress and hat even if it was dramatic!! Pretty card too, love the sparkly heart! 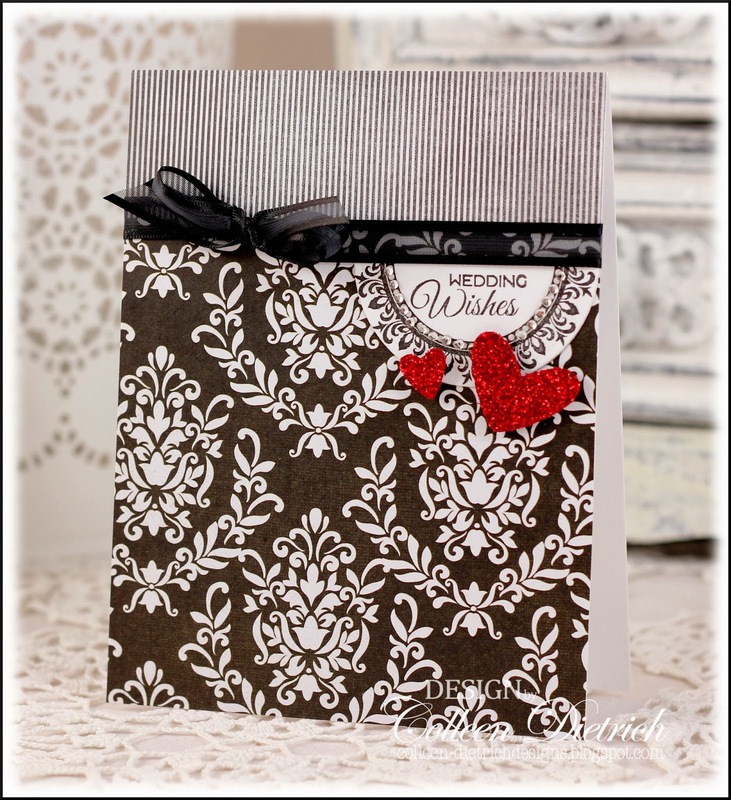 What a great post with the pretty cards, pretty picture, and helpful info. You always do the best job with your Liquid Pearls. I do love them, but forget to use them. The photo of you in your 20's is awesome! Beautiful and so elegant are the cards. Thanks for the tip on the Liquid Pearls. I never remember to use mine....maybe now I can think of them. Look at you in that wide-brimmed hat. You look very pretty. I have to say that cameras are so sensitive to light and I think that causes the problem sometimes. I think your card is elegant and beyond. I saw the rhinestones and I think the colors are awesome...and that's just my 2 cents - as that pesky Lion in the Food Lion com. says. Love the combination of the stripe with the damask stamps - simply elegant, Colleen! Beautiful cards Colleen! Great hearts, ribbon, papers - so romantic. Your picture is awesome - what a great memory and you are gorgeous! Super tip on the liquid pearls - my eyesight is so bad I never noticed my pearls had cone shapes! I guess it is good I take my pictures from super far away - LOL! Hugz!